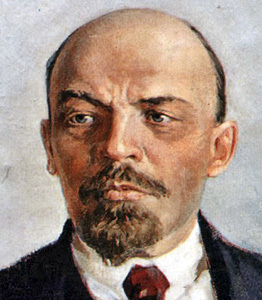 Vladimir Lenin was a leading political figure and revolutionary thinker of the 20th Century. Vladimir Lenin was born in Simbirsk in Russia into an educated family. He was an excellent student at school, and went on to study law at university. His radical political attitude was heavily influenced by the fact that his brother was hanged for attempting to assassinate the Tsar, Alexander III. Lenin was eventually expelled by the university for his extreme views, and he had to complete his studies as an external student. He became a revolutionary after he completed his degree, and was arrested and exiled to Siberia where he met and married his wife. He took the pseudo name Lenin in 1902 and spent many years in Munich, London and Geneva, and became the leader Bolshevik movement. In 1917, towards the end of World War I, Lenin return to Russia aided by the Germans in order to try to overthrow the provisional government that was ruling Russia, and eventually led the October Revolution, which led to the Bolshevik’s victory and assumed complete control of the country. He ruthlessly destroyed any opposition to his rule in an action known as the Red Terror, and introduced communist rule across the country. Lenin survived two assassination attempts, but the second attempt led to a decline in his health, and in 1923, he suffered a stroke which left him bedridden and mute until his death. Lenin’s policies industrialized Russia and eliminated unemployment, but his regime was brutal and its suppression of the people. He remains one of the most important political figures of the 20th century.